Hop aboard the Shanghai Maglev and prepare to be blasted at 270 mph into a city of soup dumplings a la xiaolong bao, sharp-elbowed pedestrians (if you don’t know you’ll soon find out), and bewildering variety: the unforgettable Shanghai. Yes, you just stepped off the plane, but no, this city doesn’t wait. And you only have 24 hours. Let our whirlwind begin! Like I said, you were just throttled at 270 mph for seven whole minutes, which means you need to cool off for a hot minute and recoup the brain cells you lost to the city’s most prestigious magnetic-levitation creation to date. You’re in luck. Yu Yuan Garden is right around the corner, and there’s no better place to seek some much-needed peace and refuge than the most famous garden in Shanghai. (“Yu” in Chinese means peace and health.) Now take a deep breath, close your eyes, exhale—and meld into the schools of locals as you slowly make your way to Shanghai’s nearby bazaar for food and vendors. Relaxed? Good. We have places to see. If it were any other day, we’d continue our peaceful time-out from the bustle of the city on an hour-long bus ride to the ancient Zhujiajiao, an authentic water village and popular day-trip destination known as Shanghai’s Venice. But today is not any other day. 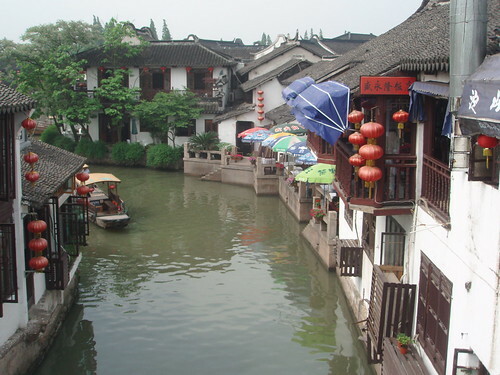 Today we only have 24 hours, and there’s no time to take a boat trip down the river and cross amazing bridges (and photo ops) to visit Zhujiajiao’s beautifully laid-out gardens and old houses. Stop that, don’t be disappointed. We’re going somewhere great too, Qibao—a similarly ancient town of live cricket fighting, shadow plays, and magnificent temples. Hey, this might be a good time to check out the most famous Shanghai temple of them all. 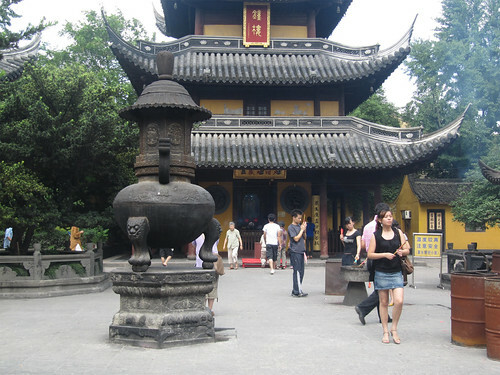 Here we are, Longhua Temple—Shanghai’s largest, most complete, and most authentic religious complex. Where’d you go? Oh, there you are, caught between those droves of travelers and 500 nearly identical, life-size golden Luohans. I would have spotted you sooner if you hadn’t hidden yourself behind that staggering seven-story pagoda. And those insanely photogenic peach blossoms. Ready for a different kind of ancient history? Me too. Let’s go. We’ve nearly made it back to modern day. One last stop: Tian Zi Fang, an arts and crafts neighborhood developed from a residential area in the French Concession. 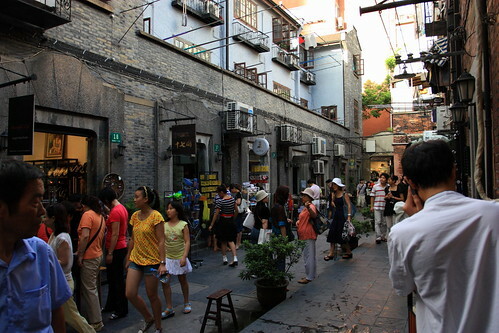 With maze-like alleyways perfect for strolling past boutique gift shops and galleries, an afternoon spent soaking in the traditional architecture and ambience of Tian Zi Fang feels like a day spent back in the 1930s. Eat, shop, and get lost. Now come back. You won’t want to miss our next stop. We’ve finally done it, surfaced into the modern world of subliminal branding, mass-production, rampant consumerism—and the cheap fake knock-off. You know you love it. 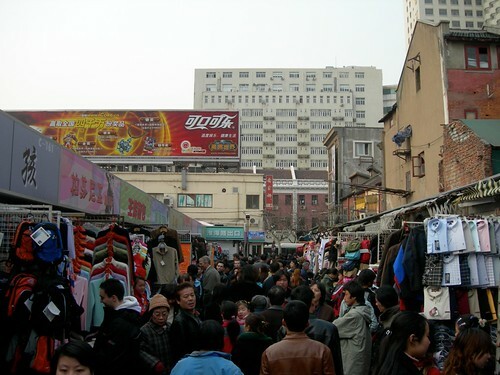 No trip to China is complete without a visit to a cheap stuff market, and the one just outside the turnstiles of the Science and Technology subway station is the one to beat for tourists. Look how organized, clean, and easy it is to navigate. And that iPhone case? You’ll take it! For 50% off of the already marked-down price. What? No sale? Fine! You’ll wait and see if you can spot it somewhere else. Yep, there it is. Who’s Hungry? 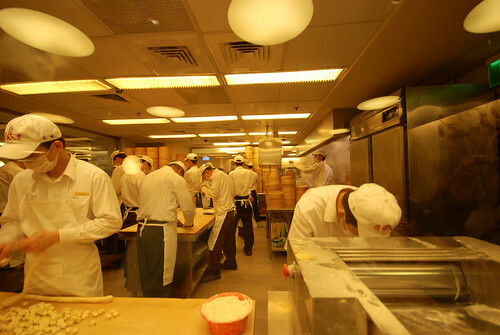 What the cannoli is to Sicilia, the soup dumpling (or xiaolong bao) is to Shanghai. Take a gander at that delicate dumpling skin, wrapped around juicy pork filling injected with a shot of delicious broth, and just try to say no. No? That’s what I thought. Now don’t be mad, but I’ve brought you to a pretty dreary-looking mall. Built by a Hong Kong developer. And these dumplings are courtesy of a Taiwanese restaurant chain called Din Tai Fung. No matter, not even three evils can stop these hidden gems from trumping every famous restaurant in town. They will all promise you the most authentic recipe, and they will all be wrong. By the look of sheer bliss on your face right now I can tell that you agree. With only an hour left we’ve made it to the rapid-fire finale. 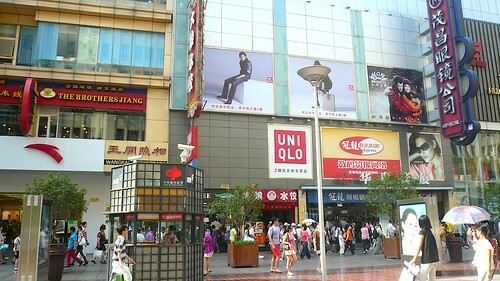 First, get off the subway and walk through East Nanjing, a mecca of Chinese consumerism with lights brighter than New York City. Now walk to The Bund (it rhymes with fund), Shanghai’s picturesque waterfront along the Huangpu River with views so luscious they double as dessert. Finally, wrap up the night (and enjoy the wee hours of the morning) at Vue Bar with tremendous waterfront vistas, terrace whirlpools, and sophistication piled thirty-three stories high. Congratulations. 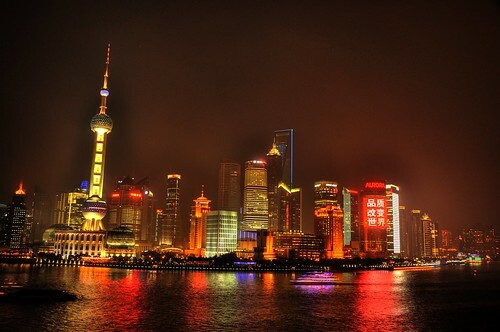 You just conquered Shanghai in 24 hours.